We’d love your help. Let us know what’s wrong with this preview of God Speaks Your Love Language by Gary Chapman. To ask other readers questions about God Speaks Your Love Language, please sign up. I received a complementary copy of this from NetGalley in exchange for an honest review. This book was incredibly logical and thought-provoking, both in how to understand the importance of love languages of others around you, but also how God uses them to help you see His love. I found Chapman's book allowed another level of worship or communication with God to open up. This book is, I believe, one of the most important things you can read if you're looking to strengthen or understand your faith I received a complementary copy of this from NetGalley in exchange for an honest review. I think so highly of this author that I didn't think it was possible, but he actually succeeded my expectations. Yeah, it was that good. If y'all have been around long at all you've probably heard how learning about the 5 Love Languages changed my life when I was in my teens. Since then I've read multiple editions of the books, told hundreds of people about them, and taken the test many times. Still, this book presented me with new information, giving me several great "ah-ha" moments where my life was brought into a clearer focus. For instance, one of my top love languages is touch. I also like to dance at church. And people at my church don't exactly dance, so as you can imagine, I've sometimes pondered why I do dance? Well, as it turns out, there's a correlation between having touch as one of your primary love languages and dancing, etc... while worshiping. I would have never guessed, but it made so much sense to me. Pretty cool, right? This book does a great job of providing a quick but good foundation as to what the love languages are, how they fit into everyday life and then showing how God speaks everyone of the love languages - which is totally wonderful. The author points out that God created languages in the first place, and He also created us to respond to certain love languages, so it makes sense that He also speaks all the love languages. The book is also super easy to read (as with all of this author's writings), interesting and gives the most practical of tips of how to make your life more balanced. As someone who has read both the original Love Languages book and singles version, I was really excited to see that there is a version geared towards every Christian and their relationship with God. The book did not disappoint. I was fascinated by the author's insight into various Biblical heroes, and what he deduced their love languages to be. I've never been a "words of affirmation" girl, but learning that David was likely a "words of affirmation" kind of guy has made the Psalms come alive eve As someone who has read both the original Love Languages book and singles version, I was really excited to see that there is a version geared towards every Christian and their relationship with God. The book did not disappoint. I was fascinated by the author's insight into various Biblical heroes, and what he deduced their love languages to be. I've never been a "words of affirmation" girl, but learning that David was likely a "words of affirmation" kind of guy has made the Psalms come alive even more for me in my personal study. Knowing in advance that my love language is "quality time" made that hater come alive so much for me! The example of George Mueller as someone who spent quality time with God in prayer encouraged me that even though prayer is one of my greatest struggles, it can become one of my greatest connections to God, as He seeks to spend that quality time with me. No wonder the devil finds ways to distract me from prayer, and provides ample ways for me to waste my time on many other pursuits. This book talks about how the 5 love languages apply to our relationship with God. The author briefly talked about the 5 love languages. He then looked at each love language (words of affirmation, quality time, gifts, acts of service, and physical touch) and discussed how God has shown His love to us in each of these ways. He also provided stories about how people with that primary love language felt most connected to and loved by God (like through studying the Bible, prayer, giving, serving oth This book talks about how the 5 love languages apply to our relationship with God. The author briefly talked about the 5 love languages. He then looked at each love language (words of affirmation, quality time, gifts, acts of service, and physical touch) and discussed how God has shown His love to us in each of these ways. He also provided stories about how people with that primary love language felt most connected to and loved by God (like through studying the Bible, prayer, giving, serving others, or worship). He then challenged readers to show love to God by using the other love languages, too. I was surprised to realize that I already do enjoy expressing my love to God using all five love languages, but I did learn some interesting insights into how people differ in how they feel most loved by God. While you get a general idea from this book, it helps if you already know your primary love language. Overall, I'd recommend this book. Thank you Moody Publishers and Netgalley for an ARC of this book. I have read a few of the love languages books and was happy to have the opportunity to read this latest book by Gary Chapman. This book is a continuation of the five love languages theme, written specially in relation to the readers relationship with god. I didn’t find anything particularly new or relevant for myself within this book, however I am sure there are many who will find his useful, especially if new to the love languages Thank you Moody Publishers and Netgalley for an ARC of this book. Parts of it were really good and very helpful. Other parts seemed to drag and sometimes I couldn't figure out what point the author was making with his story. I may have to read the original Five Love Languages though and I'm going to guess that one might be better. A excellent book, actually, if you want to know more about getting closer to God. For me, it helped me understand the different kinds of prayers and expressions of love to God. There are people who find God as they worship in church; there are people who find God in the silence of their meditation. Neither method is better or worse - each are more suited to different people. I never quite figured out my primary love language, though. Gary Chapman suggests 5 love languages - words of affirmation, A excellent book, actually, if you want to know more about getting closer to God. For me, it helped me understand the different kinds of prayers and expressions of love to God. There are people who find God as they worship in church; there are people who find God in the silence of their meditation. Neither method is better or worse - each are more suited to different people. (1) How do I often express love to other people? By listening as they speak. I really, genuinely want to listen. Perhaps, this is an act of service? Or is it quality time? (2) What do I complain about most often? That people don't listen/understand me, I think. Unkind words spoken without any explanation can hurt me very deeply if you're a person I care about very much. I'm quite sure this suggests words of affirmation speak very loudly to me. (3) What do I request most often? ...I don't. Maybe I just want someone to really care for me without asking. But I know this usually doesn't get across. (1) How do I most often express my love to God? Through worship - singing, or playing the keyboard or piano. Is this quality time? Physical touch (because I want to feel God's presence this way)? (2) What do I most often complain to God about? That I don't feel Him. I'm quite sure this is physical touch. (3) What do I request of God most often? Well, I think I should read the first Love Languages book The Five Love Languages: How to Express Heartfelt Commitment to Your Mate or the one written for singles The Five Love Languages for Singles. I'll never understand God's love, though I know He knows how to love me best. But it's the people that I want to understand, so perhaps the other books will help better. Gary Chapman is a New York best-selling author of books that treat relationship, marriage, and workplace issues and well-known author of The Five Love Languages as well as the Five Love Languages for Children / Men / Singles / Teenagers. With "God Speaks Your Love Languages" he adds another book that treats this topic. Chapman states in the introduction that "so many things influence our response to God: culture, family background, life experiences (good and bad), the teachings of our religion. But love is a matter of the heart, the soul—not ritual or religion or what our families or peers do. And each of us expresses and understands love differently—including God's love. Each of us speaks and understands love differently. I am convinced that each of us has a “primary love language,” and when we listen to God in our heart language, we will experience His love most intimately. I am also convinced that God speaks each person's love language fluently." 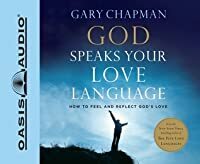 In this book which Chapman shows how God speaks the five different love languages (affirmation, quality time, gifts, acts of service, and physical touch) and he shows how the individual can use love languages in the relationship to God, especially in worship. He encourages the reader to discover his primary love language, but also to get out of the comfort zone. I highly recommend this book as a supplement to Chapman's previous "Love Language" books. Whereas the other books primarily treat the expression of love between humans, this book treats the expression between God and his children. It is a good help to realize that different people experience God's love differently and show God their love differently. I read Mr. Chapman's Five Love Languages- Single Edition before and I really enjoyed it. This Edition is really good as well. It recaps The Five Love Languages Words of Affirmation, Quality Time, Gifts, Acts of Service, and Physical Touch. He explains how they apply to a believer worships God. For example, 1. Words of Affirmation Praising God through prayer thanksgiving. 2.Quality Time Study Scriptures, reading a devotional book, mediating. 3. Gifts Money, Meeting The physical Needs of others, a I read Mr. Chapman's Five Love Languages- Single Edition before and I really enjoyed it. This Edition is really good as well. It recaps The Five Love Languages Words of Affirmation, Quality Time, Gifts, Acts of Service, and Physical Touch. He explains how they apply to a believer worships God. For example, 1. Words of Affirmation Praising God through prayer thanksgiving. 2.Quality Time Study Scriptures, reading a devotional book, mediating. 3. Gifts Money, Meeting The physical Needs of others, and Giving Encouragement. 4. Acts of Service to others, and cooking. 5. Physical Touch Washing Feet. Mr. Chapman says God communicates through worship with us through our own love languages. So, worship is more personal because we can express it through our own way. There is no barrier or boundaries. It comes down to us and God. I received a complimentary copy of this book from the publisher and I am not required to provide a positive review. All opinions are solely therein my own." Disclaimer- FTC CFR Title 16 Part 255, "Guidelines Concerning the use of Endorsements and Testimonials in Advertising." This book will help the reader to feel God’s love more peesonally! Gary Chapman reminds us that God speaks a language of love, and in time we learn to speak that language ourselves. In this book we are shown how we can give and receive God’s love through the five love languages which are words of affirmation, quality time, gifts, acts of service, and physical touch. This book includes a new chapter to this Christian Classic called ”Getting Out of the Comfort Zone.” This chapter will teach the reader the joys of Speaking the love language you aren't used to with God. I give God Speaks Your Love Language five out of five stars! Millions of people say The 5 Love Languages saved their marriage. Now Gary Chapman applies those love languages to God and those who follow Him. Some people see God as an impersonal, far away deity, but He is really an up-close-and-personal Father who chooses to speak to us in the language we are most comfortable with. This book both reveals ways that God speaks to us in each love language and shows us ways we can speak to Him and learn new love languages. I’ve never read The 5 Love Languages (Yet. But I did just buy it, after reading this), yet the author speaks so candidly and simply that all the concepts are easy to understand and relate to. I loved the sections on different forms of worship! I read the original 5 Love Languages 9 years ago and LOVED it. This offshoot of that book is equally good. I believe the book was divinely inspired because of course the Bible was written long ago and was inspired by God. God Speaks Your Love Language makes multiple references to the Bible stories that show how God uses all 5 love languages to communicate with us. He also shows how believers communicate with God in different ways. It all seems so obvious that it had me wondering how I didn’t see I read the original 5 Love Languages 9 years ago and LOVED it. This offshoot of that book is equally good. I believe the book was divinely inspired because of course the Bible was written long ago and was inspired by God. God Speaks Your Love Language makes multiple references to the Bible stories that show how God uses all 5 love languages to communicate with us. He also shows how believers communicate with God in different ways. It all seems so obvious that it had me wondering how I didn’t see this for myself. It’s obvious once you read it, it all makes sense, but it’s not one of those books that seem pointless, not at all. It’s not obvious till you read it. 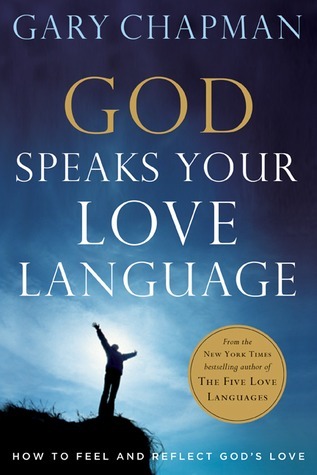 Gary Chapman, author of The Five Love Languages (words of affirmation, acts of service, physical touch, quality time, and giving/receiving gifts), says that “it is my hypothesis that people experience God’s love more deeply when God speaks in their primary love language.” Each chapter ends with questions for reflection / discussion. This book would be great for a Bible study or for ideas for preparing a sermon. It has a lot of helpful reflections and encouragement for anyone seeking to deeper their relationship with God or expand their calling to love and support other people. I started this book asking myself why am I reading this. It was for a group at church. It seemed fairly basic. The last two chapters are what really got me. It talked about how to actually do things and stretch yourself. I enjoyed that. I also enjoyed the discussion in our group. Such awesome ideas on how to show God love in each love language. Well rounded clinically researched material on how to relate to other people and how God speaks to you. Refreshing and inspirational! Great book, but a lot of it was from its original Five Love Languages, not getting to the depths I was hoping for. It hits on ways God may be speaking our Love Language, which is insightful. I found this book thought-provoking and helpful. I'd already read the basic Five Love Languages book by the same author, and was pretty sure I knew my preferred 'languages' of love (touch and quality time). This book looks at them in the light of how we best related to God, and how he gets our attention. It was reassuring to see that my reluctance to use certain styles of worship or prayer may simply stem from the ways I express love, and it was also useful to understand better how other people I found this book thought-provoking and helpful. I'd already read the basic Five Love Languages book by the same author, and was pretty sure I knew my preferred 'languages' of love (touch and quality time). This book looks at them in the light of how we best related to God, and how he gets our attention. It was reassuring to see that my reluctance to use certain styles of worship or prayer may simply stem from the ways I express love, and it was also useful to understand better how other people can relate very differently. The book was well written, with a chapter about each of the different preferred 'love languages' (words of affirmation, quality time, gifts, acts of service and physical touch) after an initial introduction. Then there are further chapters looking at love language as it relates to discipline, and speaking other 'dialects'. I think if you read the five love languages first, it would bring deeper meaning to this book. It is interesting, since becoming engaged in September 2009, I feel like it has been revealed to me that there is something about marriage that God wants us to learn about his character and how we have a relationship with Him. As I have been on this journey of discovery, I believe that this book is yet another piece of that puzzle. In learning how to love our spouse, what our own love language is, and I think if you read the five love languages first, it would bring deeper meaning to this book. It is interesting, since becoming engaged in September 2009, I feel like it has been revealed to me that there is something about marriage that God wants us to learn about his character and how we have a relationship with Him. As I have been on this journey of discovery, I believe that this book is yet another piece of that puzzle. In learning how to love our spouse, what our own love language is, and how to speak the love language of our spouse, we are also learning something fundamental about how we connect with God, and speaking to God in our native love language can open the flood gates for relationship and intimacy with Him. I loved reading about how God speaks our love language. Gary Chapman used Scripture as the foundation for explaining about the different love langauges and he gave us examples of people's life stories. You can either use this book with your devotions as a personal time with God, or it can be used as a study guide in a group of people. 4. God Speaks Love I loved reading about how God speaks our love language. Gary Chapman used Scripture as the foundation for explaining about the different love langauges and he gave us examples of people's life stories. You can either use this book with your devotions as a personal time with God, or it can be used as a study guide in a group of people. Great book! A must read. (or LISTEN to in my case) Based on the Concepts of the Five Love Languages. Basically how you feel, take in and express Love, appreciation, acceptance etc. Why sometimes we feel close to God and other times not. And how best to deal with it. Not only explains those things, but challenges us to learn all the langu Great book! A must read. (or LISTEN to in my case) Based on the Concepts of the Five Love Languages. Basically how you feel, take in and express Love, appreciation, acceptance etc. Not only explains those things, but challenges us to learn all the languages and to even explore the ones we speak the best and the ones we don't as much (because our spouses and others probably do so best learn them) Gives tons of examples that make sense once you see them, but maybe you don't think about them until you know about this after this book. Recommends it for: If anyone wants to read the book I highly recommend reading The Five Love Languages first. The audio book first recaps the five (5) love languages according to Gary Chapman and then explains how to have eternal life through Jesus. The audio book does contain some extra information that the original book, The Five Love Languages, did not contain. This consists of how God shows his love in five different ways and how each person experiences God's love differently depending on their own love language. This book did not go as in depth about how God speaks our love language as I would have The audio book first recaps the five (5) love languages according to Gary Chapman and then explains how to have eternal life through Jesus. The audio book does contain some extra information that the original book, The Five Love Languages, did not contain. This consists of how God shows his love in five different ways and how each person experiences God's love differently depending on their own love language. This book did not go as in depth about how God speaks our love language as I would have liked as it seemed to be only a section of the book instead of the book in its entirety. I love the idea of this book so much. It just didn't really get to the depths I was hoping for. While he hits on certain ways God may be speaking our Love Language to us, there seem to be so many more examples that could have drawn readers in to God's love. The best part about this book was the way it encouraged me to think about the many ways God speaks our Love Language to us (beyond what's actually suggested in the book). It has helped me in my evangelization efforts to desire to connect each I love the idea of this book so much. It just didn't really get to the depths I was hoping for. While he hits on certain ways God may be speaking our Love Language to us, there seem to be so many more examples that could have drawn readers in to God's love.